I have several portable chargers, which I mostly use when I’m working in my backyard and I can have the charger sit on my patio table. But since I started playing Pokémon GO a couple of months ago, I realized I needed one that wouldn’t be too bulky to carry around while I’m out playing the game for a couple of hours. I then remembered that I had bought a smaller charger a couple of years ago that I rarely used because my other chargers were more powerful and I could use them when size wasn’t a factor. But the Jackery Mini is perfect for when I’m out and about. The Jackery Mini is about twice the size of a tube of lipstick and weighs less than three ounces so it’s easy toss in my purse or fanny pack and doesn’t take up too much space or add too much weight. It’s super easy to use. It has two ports: one USB and one micro-USB. When you need to charge it, you plug a USB adapter cable into the micro-USB port and when you need to power your phone you reverse the cable, ie. the main USB end goes into the charger and the micro-USB end goes into your phone. Then just press the button once and your device will start charging. Pressing the button will also give an indicator of how much charge is left, from one to four lights. The indicator only stays on for a few seconds, so it doesn’t drain the charger itself (but it means you don’t have a persistent charge indicator—not a problem for me). It automatically stops charging when my phone reaches 100%. And if I accidentally hit the charging button when nothing’s attached to it, it turns off after about 30 seconds. It holds almost exactly one full charge of my Samsung Galaxy S5 phone. I can plug it into my phone at any point and continue using it, so I pretty much get double the time before my phone goes dead. Occasionally I’ll look at my phone and it’s not showing that it’s charging anymore, even though the Mini isn’t out of juice yet. When that happens I just press the button again and it starts charging again. I’m not sure what causes this, but since I’m usually checking my phone charge fairly regularly, it’s not really an issue for me. If the phone is almost entirely dead before I plug in the Mini, I can’t use the phone until it’s been recharged a bit. 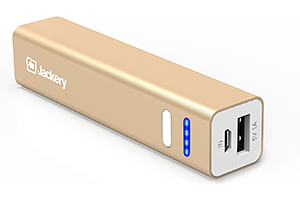 The Jackery Mini is great if you just need to increase the use of your phone by 2-3 hours (depending on how long you get on a full charge normally). And even if you have a larger charger with you, at the size and price, the Mini is a great extra one to have on hand “just in case.